Once upon a time, there was a black, white, and brown kitty that didn’t back down from a fight, but she might’ve started a few. That fabled animal still stalks the yard ’til this day and is known as this brave house cat that challenged a lion. Based on the footage of this feline face-off, it’s not clear why this cat is so eager to battle such a beastly opponent, but this amped-up animal may need to enroll in a cat yoga class of some sort because seeing cats with such an overt lack of chill is rather unsettling. 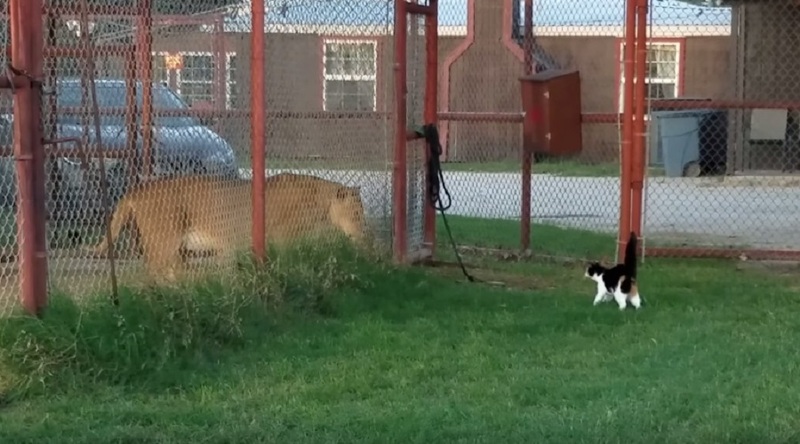 Recently, YouTuber BigCatDerek uploaded the footage of his furry friend Baggy stepping up to a lion named Noey. In the clip, Baggy squirms out of a back rub (who does that?!) and fearlessly trots over to the caged lion that lives in Derek’s animal rescue facility. Noey the lion seems amused by Baggy the cat and her power play, but Derek is justifiably terrified of the outcome. Cats will be cats, so naturally his warnings fall on deaf ears. “Baggy, abort! There’s nothing to be gained, Baggy,” Derek shouts in the video. But Baggy clearly doesn’t give a hell and proceeds to show us what it’s like to see “Little Napoleon Kitty Syndrome” in action. Fortunately, Derek writes that Baggy and Noey are back on speaking terms after their little tiff. That makes us so happy, but FOR THE LOVE OF GOD, PLEASE, CATS, LISTEN TO YOUR HUMANS. Seriously, let this be a PSA to all house cats that start feeling themselves a little too much when a lion shows up on the scene: Just…don’t.